While I rarely turn down a quinoa salad, there are few quinoa salads that I crave. Salads that I finish off and wish for more. Quinoa salads that make me excited (more that usual) for lunch. Quinoa salads that I would still eat even if they weren't healthy for me to boot. One of those such salads resides in the fabulous salad bar at the bistro near work. Although I've made it my personal quest to recreate said salad, so far I've come close but still need to work on the recipe a bit. Luckily for me, there is another quinoa salad that is just as good and it is the one I'm sharing today. There are so many things I love about it. The mustard dressing, for one. It's perfect. It's the perfect amount of tangy, spicy and mustardy. For two, there are the red bell pepper pieces. 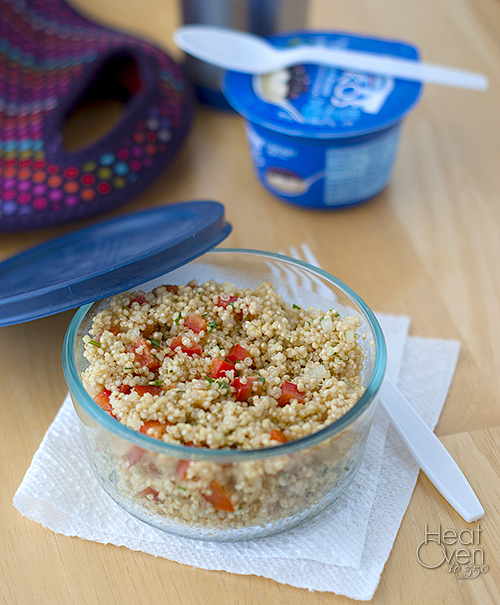 They add the perfect amount of crunch and flavor without trying to overpower the quinoa. Then there is the cilantro, which is a love, and of course, the fluffy texture of the quinoa. The only drawback of this salad is that it really doesn't make enough. I always finish it wishing I had doubled the recipe so there would be more because it makes the perfect lunch or side dish. 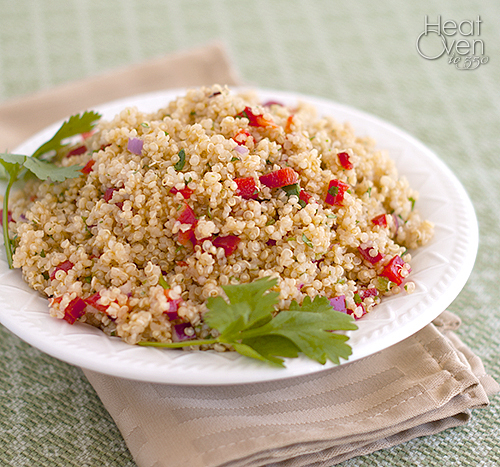 If you are looking for a quinoa salad that you will crave, give this one a try. Transfer cooled quinoa to a large bowl. Stir in the bell pepper, jalapeno, onion and cilantro. Whisk the lime juice, oil, mustard, garlic, and cumin together in a small bowl and pour over quinoa mixture. Toss mixture to coat quinoa evenly. Season with salt and pepper to taste. Serve. I love quinoa salad and haven't made it in ages. I love the sound of this with the bell pepper, spicy jalapeno, and the fresh, citrusy dressing! I'm trying very hard to like quiona, haha. When I get used to it, I'll try this. Looks nice and flavorful! I made this for supper last night along with some chicken fingers and it was really good. Quick to make too! That quinoa is so hot right now! I'm so glad you liked it! Thanks for letting me know how it worked for you.